Traditionally, a comparison review compares two watches, often of different brands in the same segment (diver, dress watch etc). Traditionally, a flieger comes in at a diameter of 40mm or above, and a Bauhaus style watch has a particular and well-known aesthetic. So, we’re breaking tradition today. We have in two watches, the Flieger Klassik 36 (Flieger) and the Antea Back to Bauhaus 355 (B2B), in from Stowa for a comparison review. But first, a little history on Stowa. Stowa is a small German company, founded by Walter Storz with beginnings in 1927. With interruption from World War II, Stowa has since produced quality German timepieces in the country’s south-west (Black Forest, Pforzheim and Rheinfelden). Fast forward to 1996 and Jorg Schauer acquires the company from the Storz family. Schauer had by then established himself as an independent watchmaker and was producing watches under his own name out of the Black Forest region. Stowa’s storied history and watchmaking experience comes into play when discussing the two watches we have in today. Both the B2B and Flieger have distinctive roots from Stowa’s watches of yesteryear, and provide an interesting counterpoint from what has come before. The first point of similarity is the size. The B2B comes in at a modest 35.5mm and the Flieger at 36mm. By modern standards, both run far below the average modern dial size. As is explained below, I consider the smaller sizes as positive attributes for the watches, but for those who are concerned, rest easy. Stowa produce Fliegers from the 36 to 40, 41, 43 and (for the TESTAF T01) 45mm. The B2B comes in 6 colourways (brown, green, pink, blue, white, black) and 3 sizes: 35.5, 36.5 and 39mm. Starting with the dials, you’ll see that both watches have Arabic numerals to indicate the hours. While the font and layout of the Flieger will be familiar to the eye, the B2B provides a departure from the traditional approach. Most obviously, the B2B has had a distinctive change in the hour marker font. This particular font was originally designed between 1925-28, further evolving in 1975, and provides an interesting change from the more utilitarian and austere approach in the Antea Klassik. Black dots enclose the numerals as a simple minute track, with grey dots providing relief every 5 minutes. The grey of the 5 minute dots matches the ghostlike Stowa logo, sitting below 12. The small seconds of the B2B also brings to mind similarities with the Flieger. While the small cut out and depth of the small seconds provides some texture and depth to the B2B, the lume of the Flieger operates in a similar way. Where the arabic numerals of the B2B are stamped and flat, the Flieger’s numerals, hour batons and minute track lift ever so slightly from the dial with the application of Superluminova C3. Speaking of the small seconds, the handset of each timepiece both comes with a surprise. The Flieger’s impeccably finished, heat-blued handset is great value at its price-point and I would have excused Stowa if it had been a painted handset. It is these blued hands that draw the eye, and provide the most interest in the piece. They really provide a lift from the dial and capture attention. The B2B, on the other hand, has black lacquered stick hands that have a metallic sheen. Certainly, as compared with traditional bauhaus watch designs, the black handset is not the norm. Together with the similarly toned arabic numerals, the handset sharply contrasts with the dial and aids legibility. Unsurprisingly, lume is absent on the B2B dial and handset. The slightly domed crystal of the Flieger does a fantastic job of aiding legibility, and draws you deeper into the watch as it, in many angles, looks like there is no crystal. The flat crystal of the B2B does not have quite the same effect, but has an effective anti-reflective coating. Unlike the above, the similarities in the case design are limited to a relative size. The B2B’s case construction runs the same as the others in the Antea line, with a 3 part construction: bezel, midcase and caseback. The lugs are full of hard lines, which runs contrary to the more playful and indulgent dial. At first it seems like a lost opportunity for Stowa to reinvent the case design with the B2B series, but has grown on me. The contrast between the updated dial, but the more traditional case design provides an interesting contradiction. The Flieger’s case is much more than a shrunken down version of the 40 and 41mm iterations. We can see that the bezel has been narrowed and the lugs given more of a sculpted and finessed curve. This gives the watch a more elegant and subtle feel, which are words not usually associated with fliegers. Few watches represent the rugged tool aesthetic more than a Flieger with a Baumuster A design. Regularly measuring over 50mm, and designed to be worn over flight jackets, the fliegers of yesteryear were for a singular purpose, and in fairness don’t translate all that well into modern life. 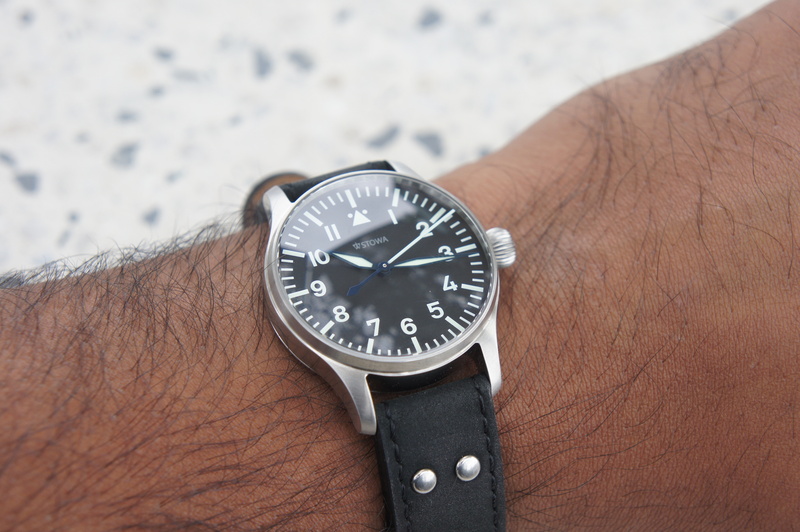 The Flieger on the other hand, is designed to fit under a cuff. It is designed to be subtle and create interest for the second and third viewing. 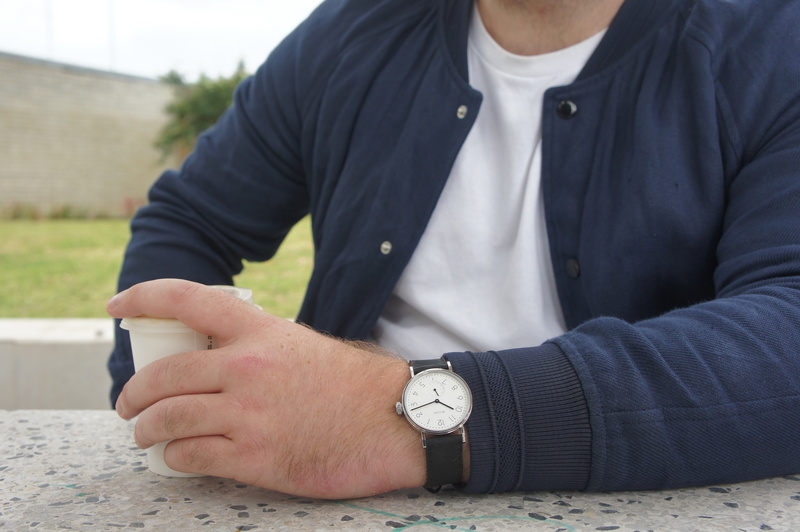 The Flieger is as legible than ever, but is provided in a smaller, more versatile package. As I mentioned above, case sizing may be a cause of concern for some. For those who strictly adhere to certain diameters as their “sizes” (37-40mm, 40-45mm, 45+mm etc), there is a good chance that the Stowa catalogue can accommodate your preferences. For those others, I would encourage you to try the smaller 35.5-36mm sizes these two pieces come in. The B2B is mostly dial with a very thin bezel and has strong angular lugs that provide wrist presence. The Flieger also has a very slim bezel and is incredibly legible. Each provides some respite from the bigger watches in my collection that can find themselves in strange and uncomfortable places at times. 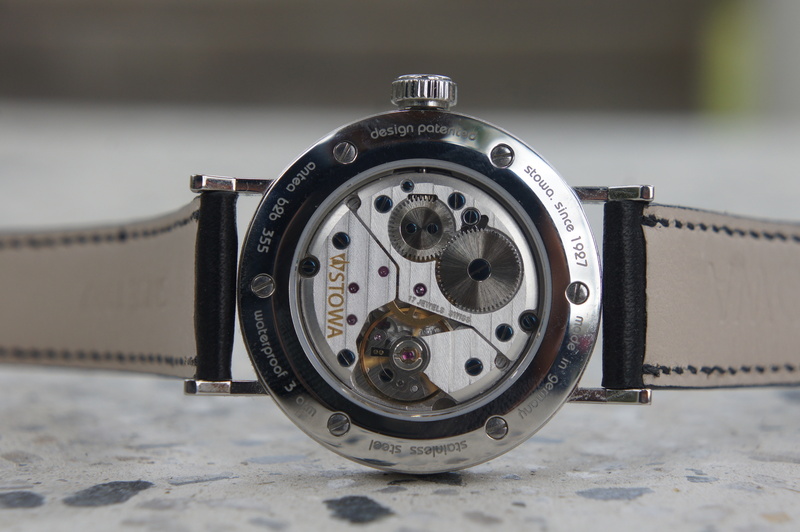 The B2B runs a Peseux 7001 (manual wind) that is visible through the open caseback. It’s nicely finished with Geneva stripes, and the movement is in nice proportion to the case size. The B2B hand winds easily, with ample assistance from the slightly larger than expected crown. The manual wind also allows the watch to come in at a very slim 6.9mm height. The Flieger runs the ETA 2824-2 top version (automatic), and also has an open caseback to show off Stowa’s specially designed rotor and perlage. While I cannot speak for whether this is the case for every flieger made by Stowa, I must confess that I got a buzz when I saw “Hersteller: Jorg Schauer”, denoting that Jorg Schauer himself manufactured the watch. The strap, together with the potential for some concentric graining in the small seconds, is my only gripe with the B2B. While it is difficult for Stowa provide it all at such a competitive price point, I’d love a shell cordovan strap or leather with a bit more texture to add further interest. The Flieger has a black, riveted strap that is rather blocky and continues the tool aesthetic. With 3 strap keepers (one metal), I’d be very surprised if the tail end of the strap ever lost its way. For those who think of the past with a deep sense of nostalgia and stubbornly resist change, it’s unlikely these watches are for you. Fliegers should be big and the Bauhaus style (at least in watches) has a very singular aesthetic. For those of you who respect the great history behind the Bauhaus art movement and the utility behind flieger watches, but are interested in a more modern iteration, I can’t give the above watches any higher praise than I have, by putting my money where my mouth is and purchasing them**. Stowa has a great history in both flieger and Bauhaus styles and both their vintage and modern offerings provide an authentic experience. Sure, there are watches with more decorated, in-house movements or finer, more minute case design. There are also cheaper Bauhaus and flieger-styled watches. But, the combination of the history, design, finishing and customer service Stowa provide is hard to beat.